Out working today. Had to walk down a forest road beyond the impassible mud pit part. Gee, that's so upsetting, you know. Smirk. However, there is nothing much there that says "spring" except for the fact that the snow is mostly gone. 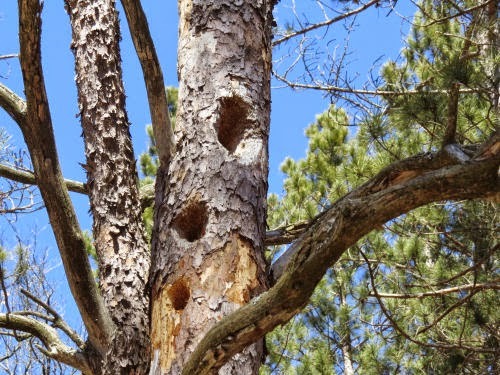 I did see some nice pileated woodpecker holes. The real sign of spring occurred at my own house. Laundry dried outside. Ahhh! That is my personal springtime milestone. The temperature broke 50 here today, I'm pretty sure. I went for a walk and specifically looked for some hints of spring. Yesterday, the skies cried and spit and threw snowballs with a vengeance. Screaming and having a hissy fit because winter has to leave? 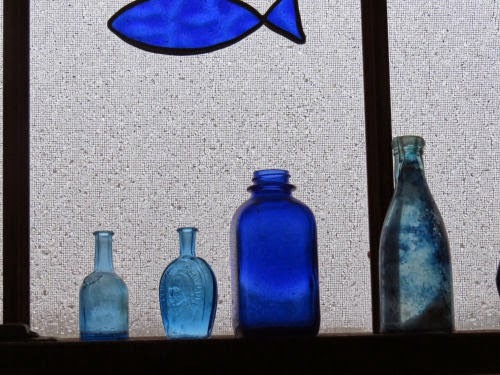 I did like the drops caught on the screen behind some of my blue glass. But it's not spring-like. 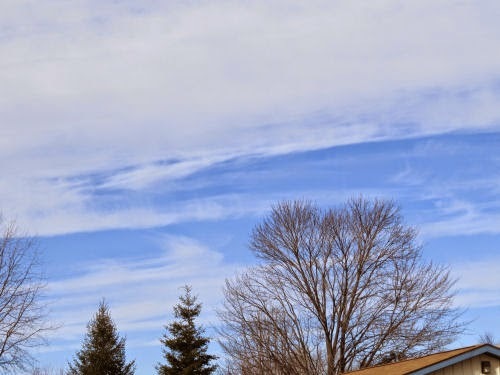 So I carried my camera around my road loop-walk, just the three-mile one, and all I found that looked like spring was a lovely blue sky. I also managed to collect about a dollar's worth of filthy bottles and cans. 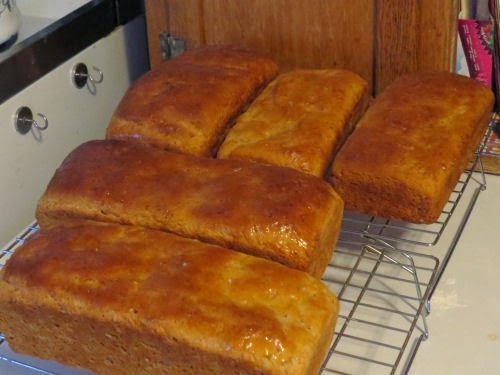 And I even remembered to take a bag with me to carry them in. I'll leave it to you to choose which is which. One is outside and one is inside. Just sayin'. 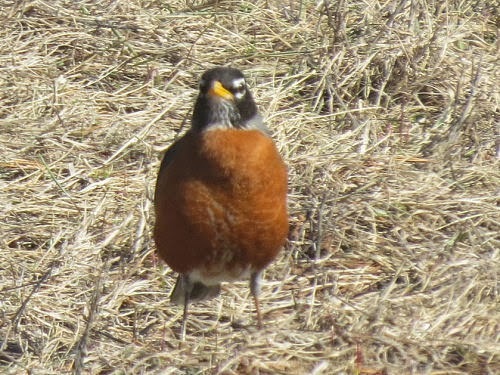 About a week later than usual, I saw my first robin of the year today. He was walking around the yard. 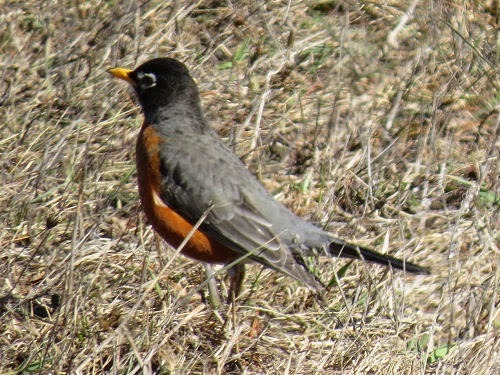 Any self-respecting worm isn't going to be anywhere near the frozen surface, but the robins never seem to starve even when they show up in the bitter cold. 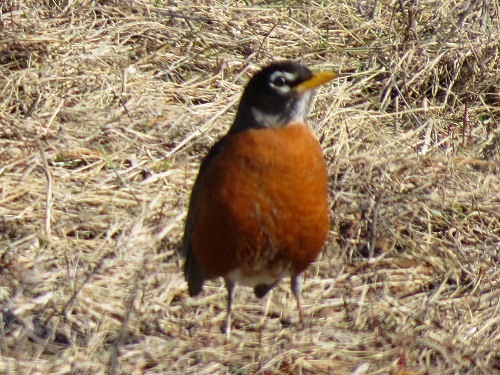 I'm not very careful with records of bird sightings, but have often noted the first robin because it's so welcome. I think it will need to warm up a little before he starts doing much singing, though. One nested on our porch last year. Perhaps we'll have a family again this year. 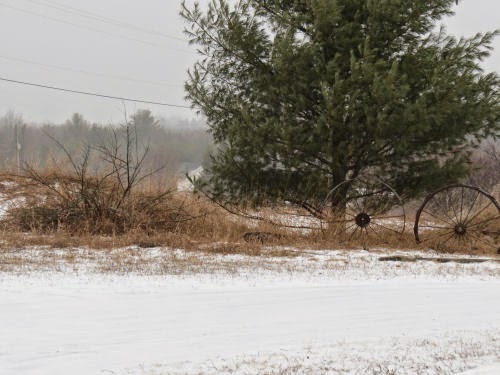 Is Winter Losing Its Icy Grip? The weather report says 9 degrees tonight. That's F for you international readers. Below zero for you guys! So... who cares? Well, hey, it's almost April. I wouldn't mind a little bit warmer. 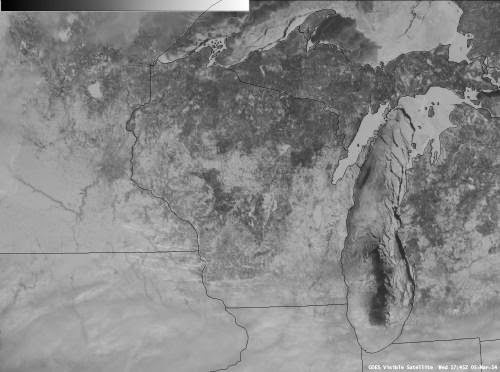 Here is Lake Michigan in a satellite photo from March 5, 2015, with almost 95% ice cover. That's a lot. The big lake doesn't usually freeze that much, but the past two winters have been cold. Excuse me. One of those two winters doesn't feel as if it's past yet. 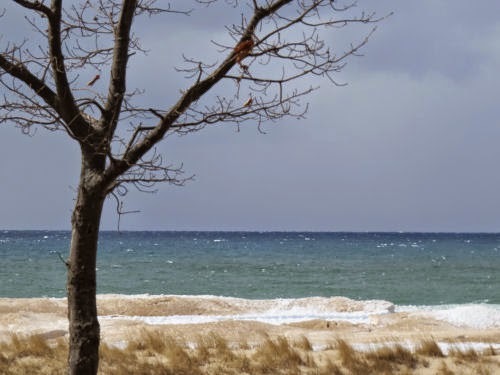 Nevertheless, today's views of Lake Michigan prove that the ice no longer has such control. 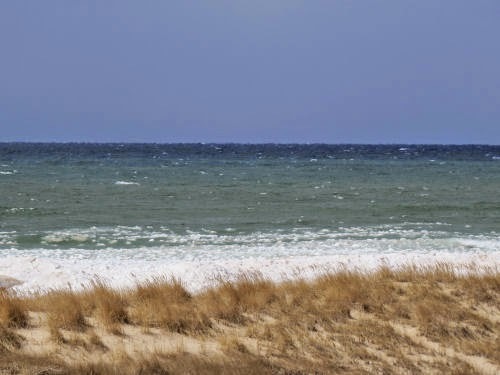 Still a big band of it along the shore, but not stretching to the horizon. Soon this will be a warm and inviting beach with green leaves on the trees. "Soon" being at least a month yet, and maybe two! 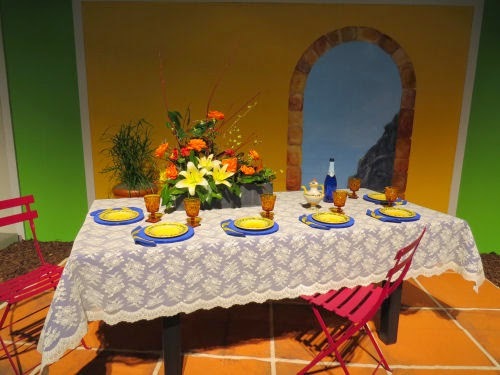 One of the regular features of the Standard Flower Show is table settings. 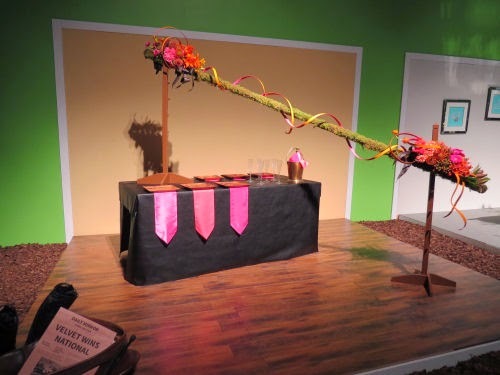 In keeping with this year's theme at the Philadelphia Flower Show of "Celebrate the Movies," each setting had to be inspired by a movie. There were four entries- Honorable mention went to Breakfast at Tiffany's. 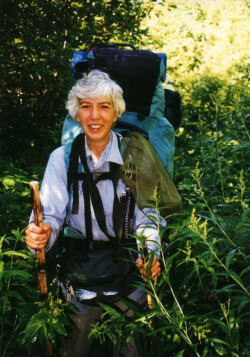 The entry was done by two women from a Garden Club. They stated the intent: "For Holly, Tiffany's was the ultimate. As she stood so many times gazing into the window, she could only dream about what it would be like to sit at an elegant table, set with fine china and beautiful flowers, and sip champagne while being served 'Breakfastat Tiffany's.'" The judges said: "Overall design a real gem. Downward placement of orchids disturbs balance." Third place (yellow) went to the Swarthmore Garden Club for Enchanted April. They said: "Bright flowers evoke the delight, peace and love four women find in a sunlit Italian garden with the sea below after escaping oppressive personal obligations and dark wet winter in post-World War I England. It is their 'Enchanted April.'" The judges said: "Placement of components creates a visual path through the overall design. 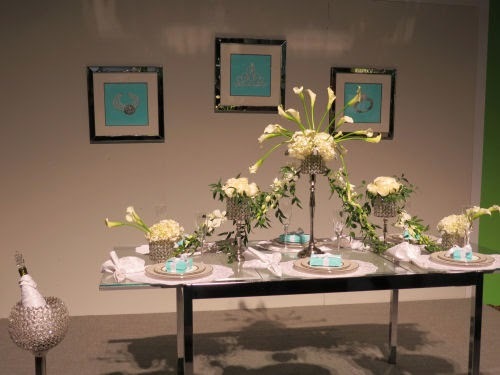 Bulls-eye of yellow lilies interrupts color rhythm and container too large in proportion to other table components." Second place (red) was taken by Twin Valleys Garden Club with Out of Africa. They said: "On our coffee plantation porch, vibrant flowers survive in tough savannah grasses and arid red earth. What clever adaptation and lion-hearted courage! Here, cast members will reunite for our 30th anniversary celebration of 'Out of Africa.'" 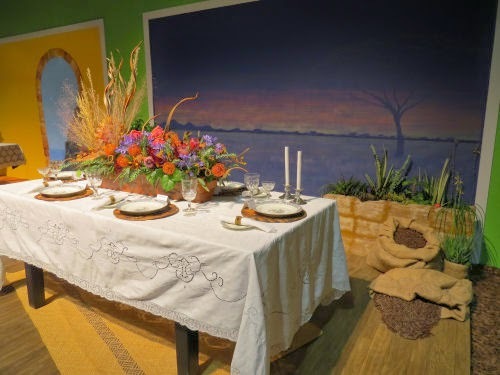 The judges said: "Color coordination between table setting and background evocative of 'Out of Africa.' Visual weight of plant material and container overwhelms." First place went to the Huntingdon Valley Garden Club with National Velvet. They said: "The Daily Mirror called the young girl that won the Grand National, 'National Velvet.' Now it is time to celebrate the pink and orange silks that crossed the finish line first. What a perfect place to gather- the barn- so Pie, the hero, can join the celebration." The judges said: "Stunning, rhythmic, colorful design brings you to the finish line!" Just in case you were wondering, Riley is alive and well and flourishing in her warm hidey-hole under the roof edge, eating expensive seeds from the bird feeder. 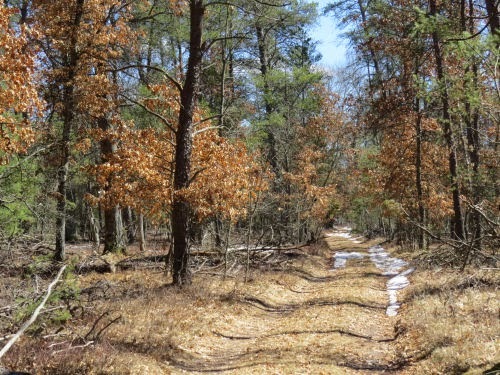 Over the winter, I learned that she likes to visit the white pine stand (well-used track). It was a great year for cones, so I'm thinking pine seeds are a diet staple too. 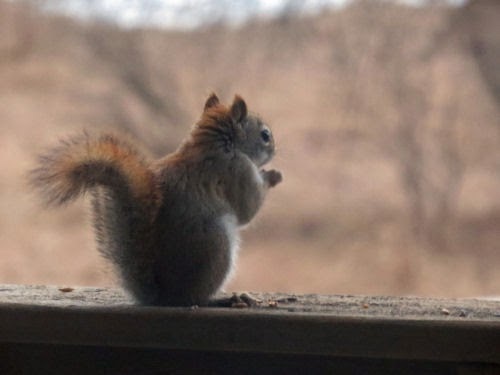 The other day I spread some sunflower seeds on the deck rail, and she thought those were great. Not that there is any big surprise there. I do hope she doesn't go find a boyfriend this spring and teach a litter of pups about the wonderful free digs. That could be an issue! Meanwhile, I enjoy her antics. 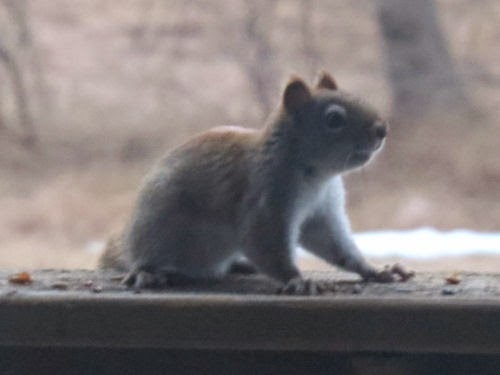 Although when she gallops across the roof you'd swear it was an elephant rather than a 2-pound squirrel. We added a second feeder, thinking that would reduce the arguments, but they all prefer whichever one is fuller and continue to argue over it rather than someone choosing the other feeder. So much for human ideas. Long day today. 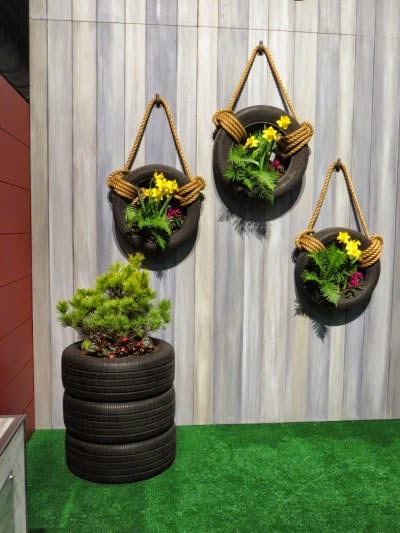 Have an interesting idea from the Subaru display at the Philadelphia Flower Show. They are one of the major sponsors. If I did this it would never look classy. It would just look like a bunch of old tires with green stuff in them. Here's another plant that was new to me. I guess it is used as a hanging basket houseplant by those who like rare plants, but I'd never seen it. 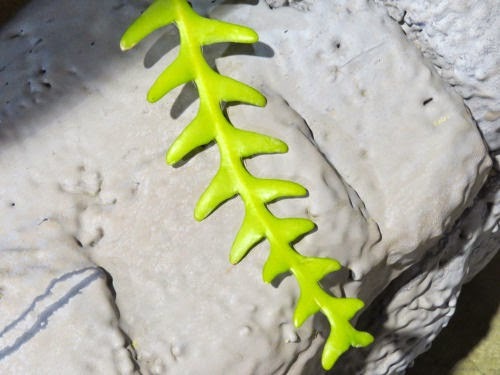 Botanically, it's something of an oddity, being both a cactus and an epiphyte. Common names are ric-rac cactus, fishbone cactus, and St. Anthony's cactus. Cryptocereus anthonyanus grows naturally at high elevations in southern Mexico, although most cultivated ones are descendents of a few plants collected about 65 years ago. 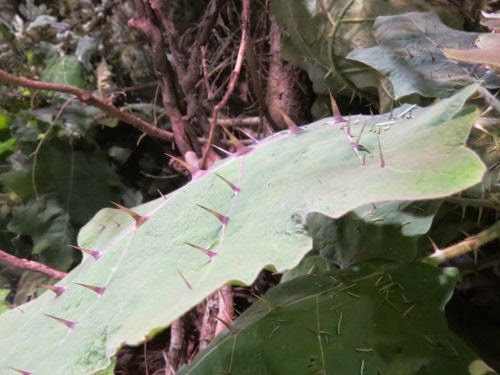 The leaves are bold and unusual and also covered with nearly invisible spines! I'm glad I didn't try touching that one. I'm beginning to see interesting things outside again. The Flower Show pictures may become sporadic. We'll see what the weather tosses our way. How's that for the truth? Yesterday I could barely get out of bed or the chair. Today I was on a roll and cleaned house. It's looking pretty good (for me!). 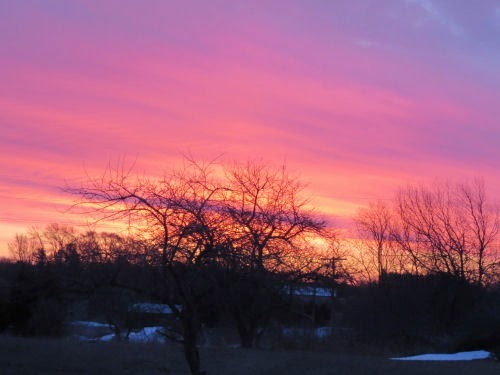 You'll have to settle for a picture of the sunrise, but I don't think you'll mind. And, as red as it was with warning, we had a nice day. Sunny, but still cold. 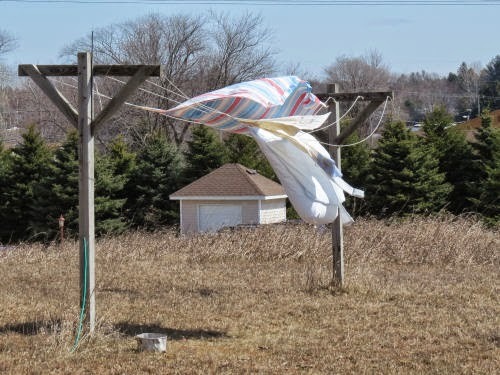 I can't wait till it's warm enough to hang laundry outside! Who knows what my energy level will be tomorrow. If I can do another day like today things will be looking good around here. (But I do have to do some other stuff, too). Just a short break from Flower Show. It's Saturday, my zombie day, and today was worse than usual. I've really done nothing except play the TrainStation game. However, I have come a long way since I last showed you my town at level 49 when I had three streets (see link below to Zombieland). I now have five, the most you can get. But you can keep sprawling sideways (for a price, of course). I'm now at level 187! You can click to see it larger. I've kept the polar themed background all winter. But it seemed like time for the snow to melt. However, I couldn't find a theme they offered that I liked for my town of Halls Crossing. But I did finally locate one that has an agricultural theme (OK, it has a castle too. It's Bavaria, but it has fields and hills, and some other picky details too pedantic to explain). Yes, the green is too bright, but that's what it is. The game almost forces you into becoming a large city because of the kinds of buildings and rewards they give. But I'm working hard to remain a small farm town. Urban growth and manufacturing have come to one sector, but its roots will remain agricultural as long as I can generate enough passengers to stay in the game. So far so good. You'll notice the farms and vineyards on the right side. And the turn-of-the-twentieth-century downtown area is still the core of commerce. So, at Halls Crossing it's suddenly summer! In the real world it was sunny but cold. If I'd felt halfway human I might have taken a walk. As it was, I barely got out of bed. 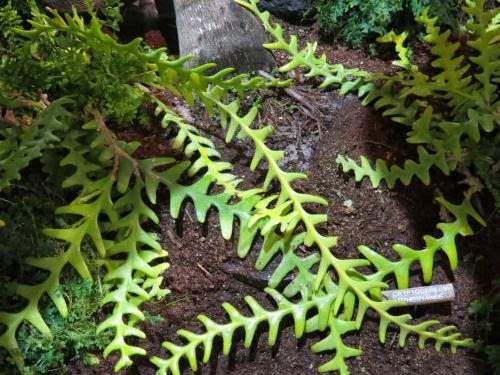 I always love to learn new plants, and I found several at the Philadelphia Flower Show. I'm sure there were more than several that I didn't know, but sometimes the labeling isn't so good, and some plants just don't catch my eye. Solanum quitonese sure did. 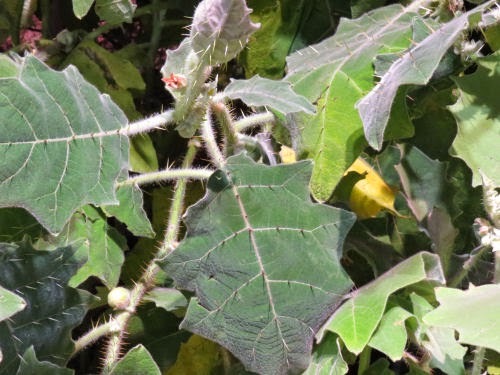 Common names are naranjilla, or lulo. 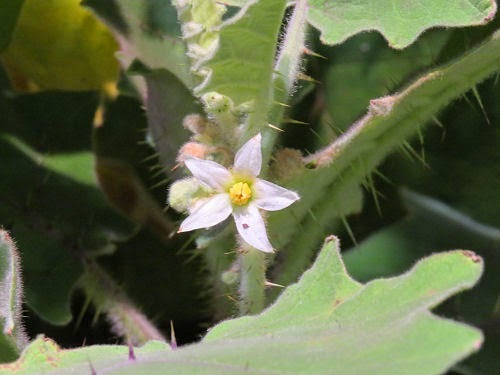 If you are a botany person, you realized right away that this is a Solanaceae, related to the tomato, and deadly nightshade, among many other plants. The flower is easily recognizable. The leaves are pretty similar to nightshade, too. Except for one "little" detail. Can you see it? It doesn't show as well in that picture. Let's try another one. Look at those "hairs!" At least that's what Wikipedia calls them. You aren't supposed to touch the exhibits, and for some reason I obeyed the rules this time, so I can't tell you if they are soft or sharp. They are certainly impressive. Did you guess from the name that it's South American? It does grow in the area around Quito, Ecuador. The fruit looks a lot like a smallish tomato, and is supposed to be tart with a taste something like a cross between rhubarb and a lime. Some of the related plants are poisonous, but this one is edible, and is used to make a drink, when sweetened. Apparently, there have been efforts made to grow it commercially, but the plant doesn't do well in cultivation, and the fruits are very fragile and don't ship well. It prefers semi-shade, but can make a nice specimen plant in the right climate. I don't think Michigan is going to be it! I'd sure love to taste the fruit, though.